Protein is an essential part of any diet. After all, protein is literally the building blocks of our cells. Protein not only composes the structure of every cell we have, and is the building block of hormones, enzymes, and antibodies, but protein also helps the body to carry out many essential life processes. It is commonly assumed that the best and only source of protein comes from animals. There is no denying that protein is critically important, but often times people get confused as to whether or not plants can provide our bodies with adequate amounts of protein on their own. The answer is yes, a thoughtfully planned plant-based can provide the human body with all of the protein it needs to thrive. Many people believe that you cannot consume enough protein on a vegetarian or vegan diet, but that simply is not true. Plant-based protein sources can help you to meet your daily protein requirements whether you are currently eating meat or not. To help you get more familiar with some of the best plant-based protein sources out there, my intern Brittany has put together a fantastic list of Everyday Plant-Based Proteins To Add to Your Diet. This week on Good Day Rochester I stopped by to share some delicious plant-based recipes using canned foods for Heart Month. The decision to adopt a vegan, or plant-based, diet is a unique choice for everyone, and even more difficult for those who are trying to find the right diet while managing Hashimoto’s and Hypothyroidism. Whether stemming from concerns over animal welfare or the understanding a plant-based diet can decrease morbidity and mortality associated with chronic disease, everyone must make the decision for themselves and their health. There have been some concerns that vegetarian diets may be low in the critical nutrients needed to support thyroid function, such as calcium, vitamin D, zinc, and iodine, leading to the aversion of a plant-based diet. 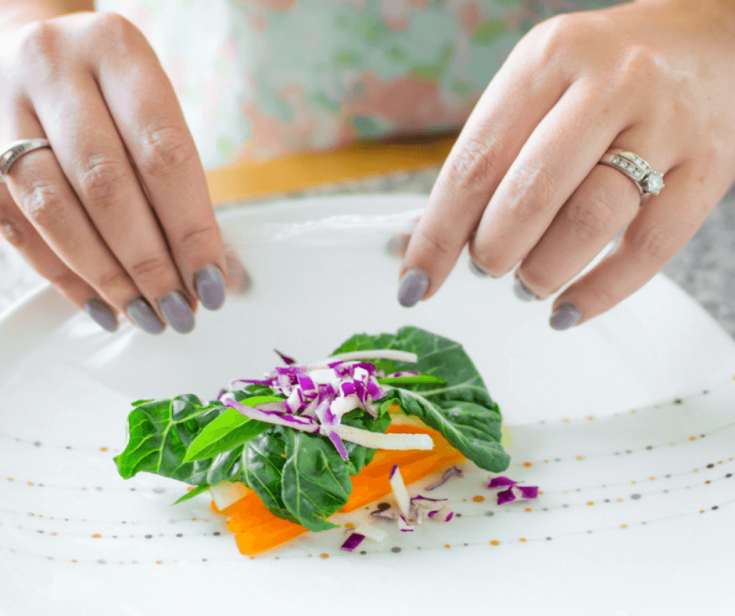 However, a National Institutes of Health study conducted to explore the relationship between a vegetarian diet and the prevalence of hypothyroidism, found that vegetarian diets were not associated with an increased risk of hypothyroidism. In fact, a vegan diet was actually associated with a lower risk of developing hypothyroid disease. 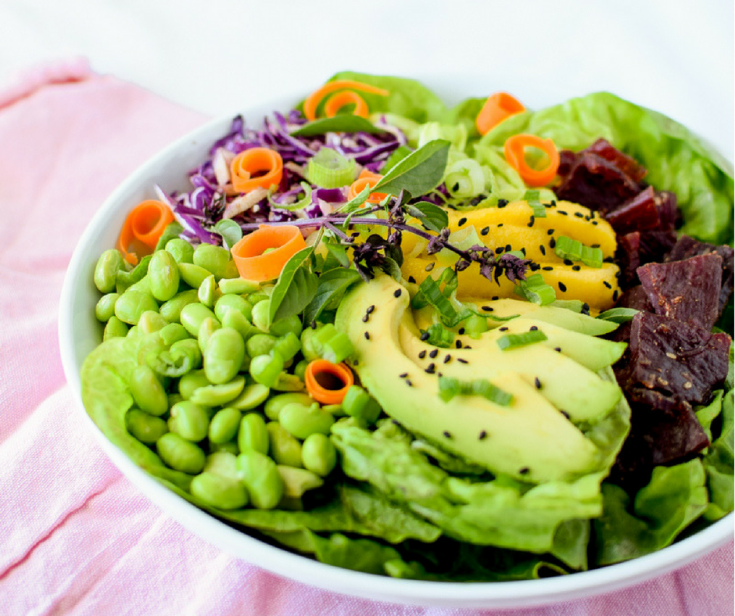 When following a plant-based diet for Hashimoto’s and hypothyroidism, it may be helpful to work with a registered dietitian during the Elimination Provocation diet or Autoimmune Paleo Protocol diet phase, when most vegan diet staples such as beans, legumes, and grains are restricted. Once you identify which foods you are sensitive to, it is easier to know which plant-based meals are best for your health. 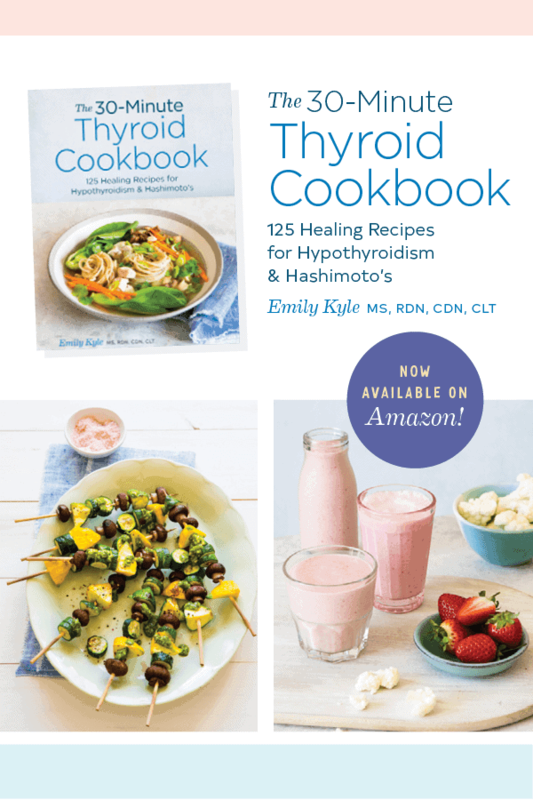 In respect to the healing power of plants, my cookbook, The 30-Minute Thyroid Cookbook, includes 75 delicious vegan recipes, plus 12 more with easy swaps to make vegan-friendly. The infamous “You’re not eating meat?! So where are you getting your protein from?” phrase is something you’ve probably heard before or had someone ask you. You’ve also probably heard fitness gurus say over and over again– “Eat lots of protein!” as they load ground turkey into their Tupperware container. But the truth is, meat and dairy products aren’t the only source of protein out there. There are many nutrient-dense, plant-based protein options for those days where you’ve had enough meat and dairy products, or have decided to eliminate them all together. Below, you’ll find good sources of plant-based proteins filed under certain mealtimes to give you an idea of when you could incorporate them into your day. Remember, these are just suggestions so don’t hesitate to have them at another time of day. Waking up after a good night’s sleep is sometimes rough. Not eating breakfast is even worse – at least in my opinion. Most mornings can be a blur for some people and convenience foods may help get the job done. Unfortunately, these items are usually loaded with empty calories and lack nutrients. Have you ever taken a step back and thought about how you could add plant-based protein to your breakfast? You’ve probably seen them before and have witnessed hundreds of posts where they’re used to making oatmeal. Oatmeal is a great option for a quick and simple breakfast. A ½ cup serving of oatmeal contains 13 grams of protein, which is about the equivalency to two hard-boiled eggs! Not to mention, oatmeal is a great source of dietary fiber to keep you fuller longer. You can simply add water or a non-dairy milk to make oatmeal and customize it to your liking (i.e. adding fruits, sweetener, spices, etc.). Soy milk is one of the highest protein non-dairy kinds of milk available on the market today. A single cup of soy milk has 7 grams of protein which almost compares to a cup of cow’s milk which has 8 grams. Fortified soy milk provides calcium, vitamin D and vitamin B12. To enjoy, pour into a bowl of cereal or add into your breakfast smoothie, the possibilities are endless. One word of caution with soy milk, be wary of the sugar content. Selecting unsweetened varieties is a great way to avoid the added sugars that are often added to non-dairy milks. 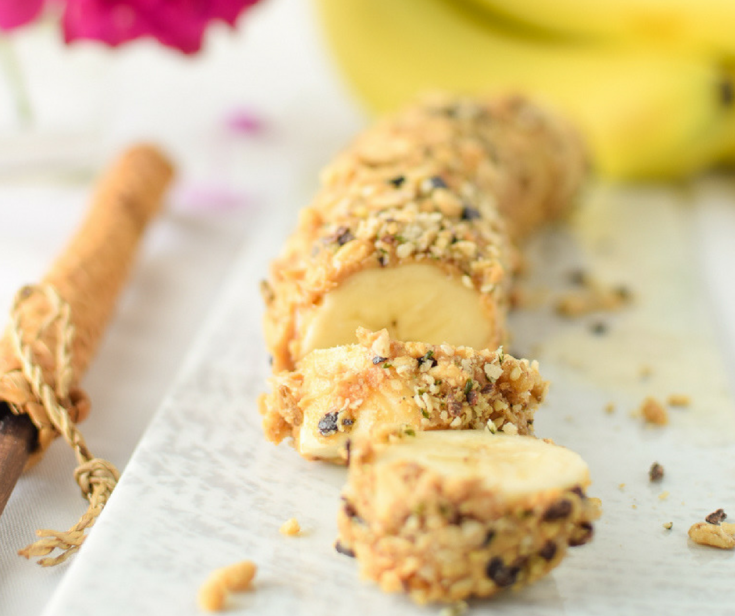 A collection of delicious, easy to make Plant-Based Breakfast Recipes that use plant-based protein sources such as oatmeal, quinoa, plant-based yogurts and more. 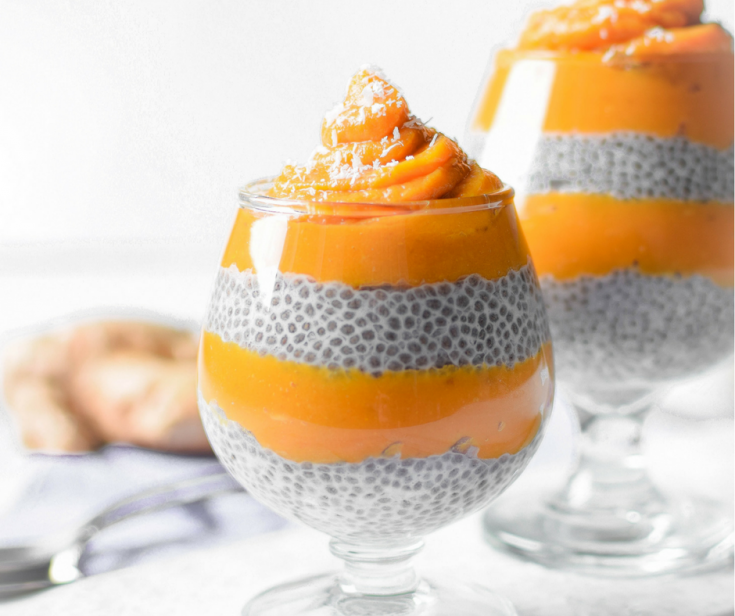 For breakfast or dessert, this Sweet Ginger & Coconut Chia Seed Pudding is a naturally healing, anti-inflammatory treat that tastes as good as it will make you feel! 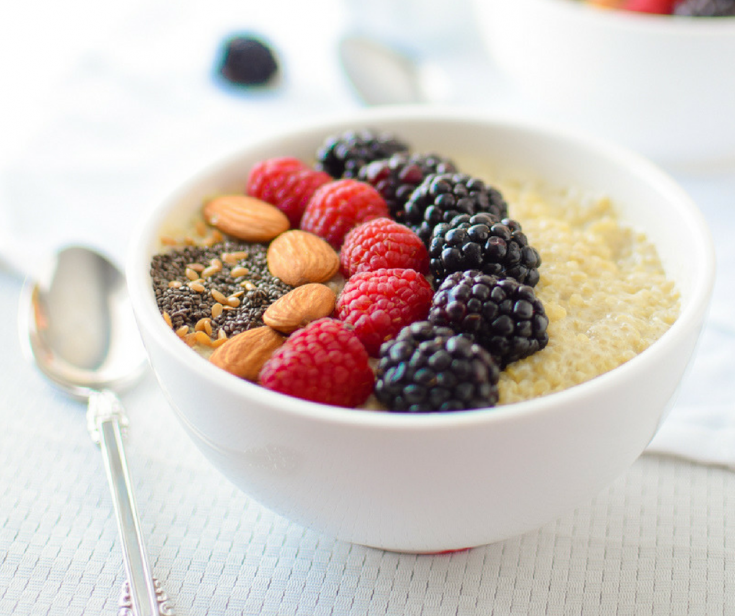 This Berry Quinoa Breakfast Bowl is a naturally vegan and gluten-free power bowl that has 17 grams of plant-based protein and all of the nutrients your body needs to stay full and focused all morning long. As Featured in Fitness Magazine! Naturally vegan and gluten free, this Golden Milk Quinoa Porridge Bowl is an anti-inflammatory, plant-based bowl of goodness with a warm, sweet flavor that will help you heal from the inside, out. The smoothie of your dreams, this vegan, gluten free Berry Coconut Wine Flour Smoothie Bowl contains a full serving of fruits, a full serving of vegetables, and the delicious superfood Wine Flour. Fast forward a few hours, our bodies may start asking us what’s next—sometimes in the most undesirable way. A well-rounded meal can keep you on your toes and inhibit the 3 o’clock crash. Your body has been up and moving, so what better way to thank it than with a delicious meal? A trendy food that started thousands of years ago in South America, has received much attention and for good reasons too. Quinoa is a very versatile food that is a complete protein. A complete protein food includes the nine essential amino acids. A cup of cooked quinoa provides 8 grams of protein, along with fiber, iron, omega-3 fatty acids and so much more. While the amount of protein doesn’t compare to a 3 ½ ounce of chicken at 31 grams of protein, the beautiful thing is that many other protein rich sources can be added to quinoa to enhance flavor and nutrition. Quinoa is a naturally gluten-free grain, too. I particularly haven’t experimented much with lentils because it’s one of those foods that need a good combination of spices to make it just right. Yes, I’ve tried to eat it plain once before and haven’t touched it again since. However, a cup of lentils has 18 grams of protein and about ½ of the recommended daily intake of fiber. Lentils are a food that can be added to many dishes and will positively impact the nutrition profile. My word of advice: Find a recipe that’ll keep you coming back for more! Legumes are staple foods that may already be in your pantry. Chickpeas and beans can be dressed up or down and be added to (almost) every dish. Both provide 15 grams of protein per cooked cup and are good sources of fiber, complex carbohydrates and iron. Chickpeas can be grounded to make a yummy hummus. Beans can be served with rice or mashed together to make burger patties. 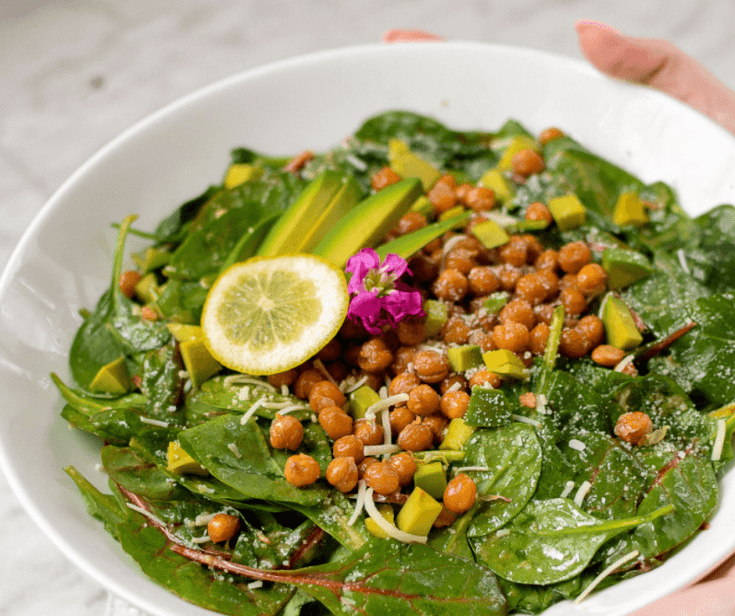 Delicious and nutritious plant-based lunch and salad recipes featuring plant-based protein options like beans, legumes, chickpeas, soybeans, tofu, edamame, quinoa, lentils and more. Enjoy this high-protein, gluten and dairy-free Korean Bulgogi Beef Salad Bowl made with fresh butter lettuce, avocado, juicy mango and lean beef jerky for a wholesome, filling meal. This post, Crispy Curry Chickpea Salad with Tahini Yogurt Dressing, is sponsored by Align. As always, the opinions stated here are always 100% my own. Whether it is for breakfast, lunch, or dinner, everyone will love this fresh, savory and naturally gluten-free Caprese Salad Grain Bowl anytime of the day! Come see just how good the rainbow can taste with this vibrant, high protein, Rainbow Chicken Quinoa Salad that is naturally dairy and gluten-free! Enjoy the nutritional benefits of both powdered beets and beautiful spiralized beets in this veggie packed Rainbow Hummus Beet & Veggie Wrap sponsored by my friends over at Love Beets! 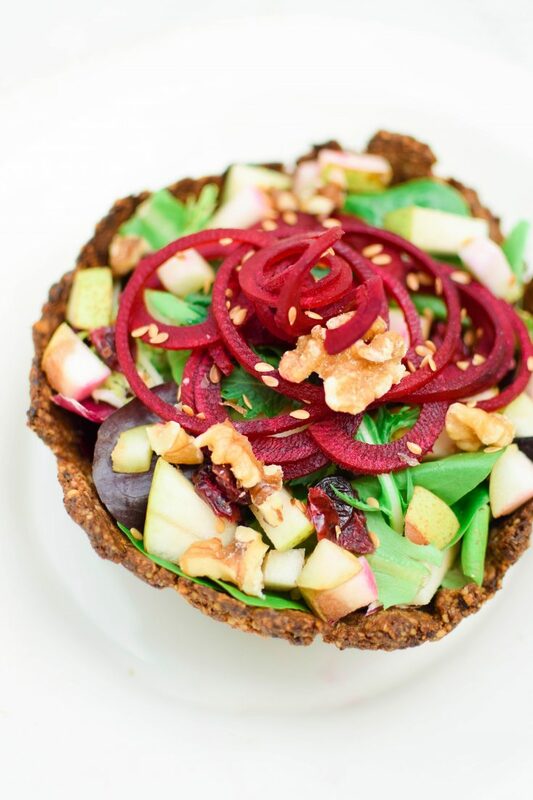 Enjoy a fresh and delicious Beet & Apple Salad in an Edible Walnut Salad Bowl for a hearty plant-based, whole foods meal. Made with walnuts and dates this crispy crust can hold all of your favorite salad ingredients while providing the body with protein, fiber, vitamins, and minerals. Bedtime is right around the corner, but you can’t go to bed hungry! Your body enters a repairing process when you’re asleep, so it is important to fuel it properly throughout the day. A popular food that resembles the texture and appearance of cooked meat. It is made of wheat, so it is not suitable for those who have celiac disease. A 3 ½ ounce serving of seitan provides 25 grams of protein, making it the richest source of plant-based protein on this list! Seitan can be prepared similarly to meat—grilled, pan-fried or sautéed. Soybeans are also a complete source of protein and these foods are all derived from them. A cup of tofu has 20 grams of protein. A cup of tempeh contains 31 grams of protein. A cup of cooked edamame provides 17 grams of protein. Tofu receives its flavor from the ingredients its prepared with, meanwhile tempeh has a nutty taste on its own. On the other hand, edamame makes a perfect snack or can be incorporated into soups or salads. You can’t go wrong with these! Want to add a vegetable option to tonight’s menu that is rich in protein and is not made from soybeans? A cup of cooked green peas contains 9 grams of protein, which is slightly higher than a cup of cow’s milk. Add it to a recipe or serve it on the side, green peas are a great addition to the dinner table. I’ve touched on several rich plant-based proteins, but the list doesn’t end there. Almonds, chia seeds, nuts, nut butter, spirulina and hemp seeds are other good sources of protein that I believe should have a category of their own. They can be easily sprinkled into your favorite recipes to add texture, flavor, and nutrients. Delicious Plant-Based Proteins to make complete dinners and entrees featuring beans and legumes, tofu, tempeh, whole grains, nuts, seeds and more. Everyone in the family will love this Perfectly Baked Cheesy Crispy Tofu, a mouthwatering, delicious and naturally gluten free entree or snack. Tofu is not just for vegan or vegetarians anymore, this is the perfect recipe for first time tofu consumers! 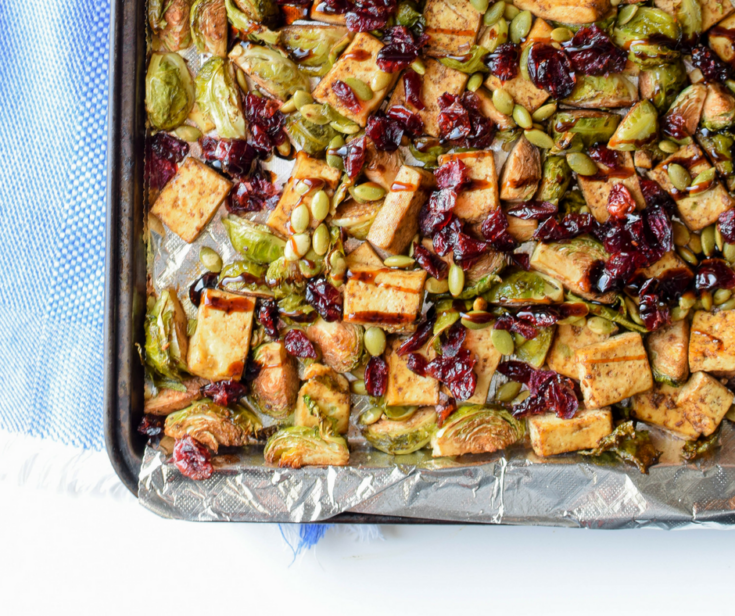 Everyone in the family will love this easy-to-make, easy to clean-up Sheet Pan Garlic Tofu & Brussels Sprouts dinner that is naturally vegan, gluten-free, and bursting with Fall flavor! 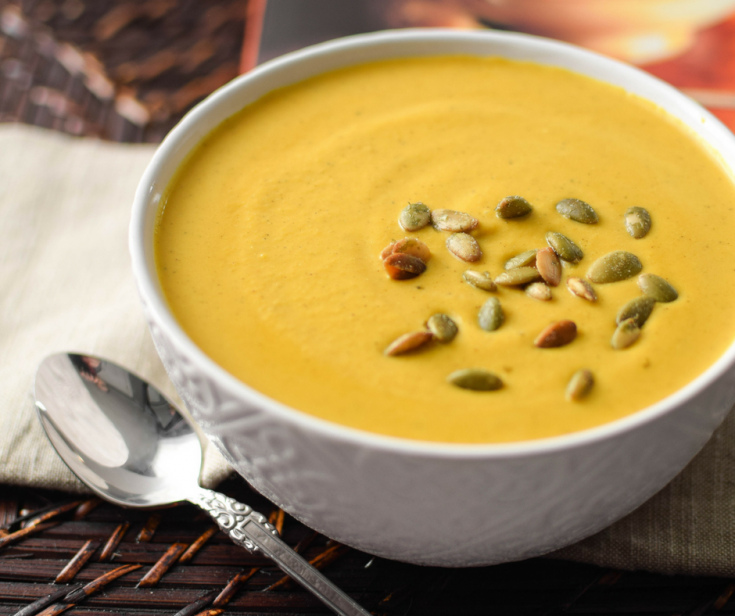 This smooth and creamy, vegan, gluten-free & whole30 friendly Turmeric & Coconut Roasted Butternut Squash Bisque is an antioxidant packed, anti-inflammatory one-pot-wonder the whole family will love. Savor all of your favorite fall flavors with this naturally vegan, nutrient dense, Autumn Harvest Plant-Based Protein Power Bowl that will leave you feeling warm, full and satisfied. In today’s society, meat and dairy products are such staple foods in the American diet that it may seem impossible to do without. Now that you’ve learned about the many protein alternatives to meat and dairy products, hopefully you can use this information to educate others about plant-based proteins. Hey! I’m Brittany Blanco. I was born and raised in Northern Virginia. I am a recent graduate of Radford University with a bachelor’s degree in nutrition and Dietetics and am currently working in school nutrition. I plan on doing my dietetic internship soon with my field of interest still up for debate– the possibilities are endless. When I’m not busy with work, I’m most likely sipping on bubble tea or stocking up on skincare products. I love to travel, especially to visit my family in Mexico and stuff my face with my grandparent’s delicious Mexican cuisine.